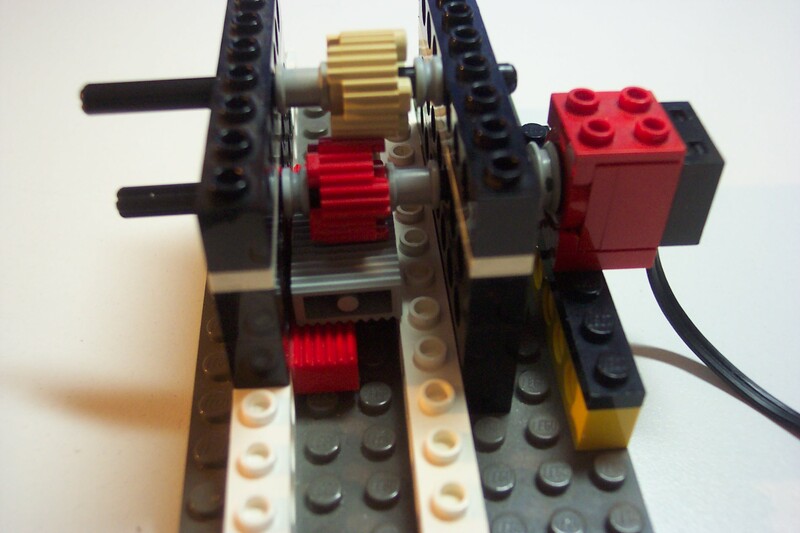 Chris Magno published on the LEGO Technic forum at LUGNET, a curious finding on the properties of a SYSTEM part. Probably not much useful but still quite interesting! The fact is that grooves on the new 'Brick Round, 2x2 with Grille' (part 92947) inter mesh each other and because these bricks have also an axle-hole, they can be used as a gear once properly positioned at the right spacing into a Technic grid. Please find what this is all about, from the picture and video below. Another nice feature is that the transversal grille on the "backside" of the brick can be used as a grooved runner. Guess this might turn not very useful and definitely not much powerful in terms of the supported torque, but still may have some use on compact models requiring reduced backslash and torque!? To see if it will ever come into use at MOC. This is an interesting use of "System" parts -- it looks like the round bricks are rolling a slab of hot steel! However, if one is concerned with compactness, the System assembly is "fatter" than the conventional Technic gear/rack combination would be. A pair of round profile brick 'cogs' would be great for crinkling tin foil, to make Christmas decorations. Another application where LEGO takes over from Meccano! This actually could be useful in SYSTEM MOCS. This could be used as a mechanism for functional sliding doors and more. I expected this to happen sooner or later; as a Technic person I said this on day one as I saw the new part. Didn't expect the 1 x 2 grill brick though, nice find. It's probably only a gimmick though. By the way, those 2 x 2 round grill bricks could be great as hand of god wheels, as they have a nice grip, much nicer than the 12t and 20t double bevel gears. When TLG make round profile bricks in brown, they could be used as cogs in Castle gate mechanisms. The 1x2 profile bricks enable unusual offsets in different directions - 1/4 and 3/4 plate high or 0.1, 0.3, 0.5, 0.7 or 0.9M wide for instance. This might be able to interact with the differences in width between studless Technic parts and traditional bricks with holes. Gimmick or not, functional or not, much respect for seeing a piece or two in an entirely new way, and making it "work". Kudos Chris!